Central cooling system: The corrosion and other problems associated with salt water circulation systems can be minimized by using it for cooling central coolers through which fresh water from a closed general cooling circuit is passed. The salt water passes through only one set of pumps, valves and filters and a short length of piping. 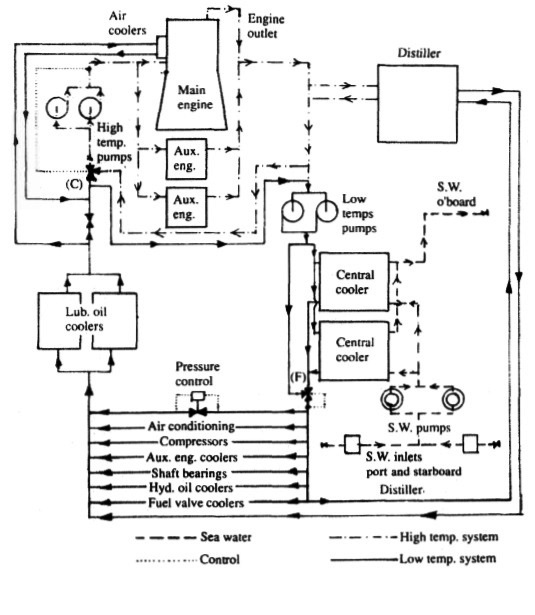 Figure 1 shows a complete central cooling system in which all components are cooled by fresh water. The three sections are (1) the sea-water circuit; (2) the high temperature circuit; and (3) the low temperature circuit. The duty sea-water pump takes water from the suctions on either side of the machinery space and after passing through the cooler it is discharged straight overboard. The main and stand-by pumps would be of the double entry centrifugal type but, as an alternative, a scoop arrangement can be incorporated (Figure 2) with central cooling. A main circulating pump must have a direct bilge suction for emergency duty, with a diameter not less than two thirds that of the main sea-water inlet. In motor ships a direct suction on another pump of the same capacity is acceptable. Materials for the reduced salt-water system for the central cooling arrangement will be of the high quality needed to limit corrosion/erosion problems. Water in the high temperature circuit, is circulated through the main engine and auxiliary diesels by the pumps to the left of the engine in the sketch. At the outlet, the cooling water is taken to the fresh water distiller (evaporator) where the heat is used for the evaporation of sea water. From the outlet of the evaporator, the cooling water is led back to the suction of the high temperature pump through a control valve (C) which is governed by engine inlet temperature. The control valve mixes the low and high temperature streams to produce the required inlet temperature, which is about 62 deg C Engine outlet temperature may be about 70 deg C For the low temperature circuit, the heat of the water leaving the central coolers is regulated by the control valve (F). Components of the system are arranged in parallel or series groups as required. The pressure control valve works on a bypass. The temperature of the water after the cooler may be 35 deg C and at exit from the main engine lubricating oil coolers it is about 45 deg C The fresh water in the closed system is treated with chemicals to prevent corrosion of the pipework and coolers. With correct chemical treatment, corrosion is eliminated in the fresh water system, without the need for expensive materials. 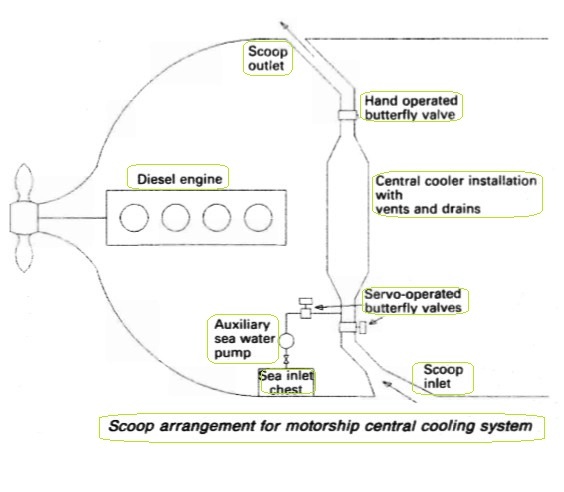 A scoop (Figure 2) designed to supply sea-water circulation through the central coolers while the vessel is underway, may be installed instead of a conventional sea-water circulating pump. The scoop imposes some extra drag on the hull so that the power for sea-water circulation is supplied from the main propulsion instead of from the generators and electrical system. Economic advantages are claimed for a correctly designed scoop but the arrangement is viable only for a simple straight through flow as for central coolers or the large condenser of a steam ship. The electrically driven pump is used only for manoeuvring or slow speeds. It is of smaller capacity than would be required for an ordinary circulating pump.